Inpector General of Police, Ibrahim Idris yesterday visited the red kidnapping spot, Rijana, located along Abuj-Kaduna dual carriage express way, Kachia local government area of the state to assess the ongoing operation and to seek possible collaboration with locals to checkmate the menace. Rijana, a small community which is about 35 kilometers from Kaduna the state capital has been home for deadly kidnappers along the ever-busy highway where several people including high and low Nigerians and foreigners have suffered cash and kind loss before the deployment of a joint task force to the area. The road is safer for motorists at least for now. 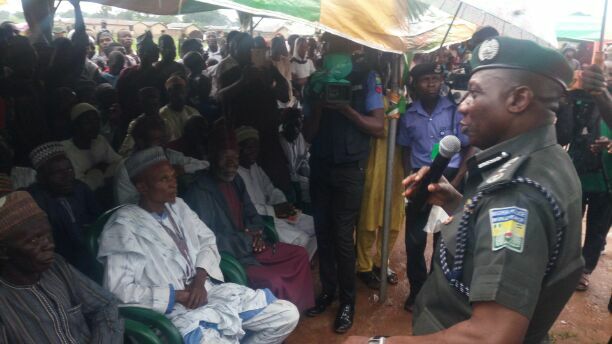 Addressing the newsmen shortly after the meeting, the Police boss, who was accompanied by other top shots in the force vowed to use all legal apparatuses to fight crime to a standstill in the country, promising to establish a sizeable police station at Rijana and recruiting youths from the area into Nigerian Police Force as requested by the community. According to him, “we are on the visit to assess the the situation of the ongoing operation aiming at flushing out kidnappers and other criminals that have been terrorising people on this road. We are also here to see how we can enhance corporation and partnership with this community and boost the moral of our men who are on this all important mission. “As you can see, I gave a lot of time to hear their views and comments. The main purpose is to increase security along this area. Of course you can hear some of their complaints; they need a police station and they want their children to be recruited into the police and I promised we are going to do that. “We are going to build a police station there and make commendation to the state government, deploy more police and increase the commitment of the people to see that we work together to achieve maximum security of lives and property along the highway and other corridors. On kidnapped Lagos school children the IG said, “I want to assure Nigerians that very soon, I don’t want to give date, you will see result with active support of the state government. Lagos terrain is different. Even the school was located along the creek and that is why we want government to star discouraging people from building in that kind of area”. Earlier, one of the village chiefs representing Doka in Rijana, Bitrus Gimba said the presence of the police has really helped them security wise, ” we can now sleep peacefully unlike before when the village was not at peace, we sleep with one eye open and the other one closed. Another local who pleaded anonymity lamented that, they have suffered in the hands of these criminals saying “whenever we go to the farm they would come and arrest us along with our animals (cows) and their faces are opened, we thank the inspector general of police for bringing his men to our rescue”.